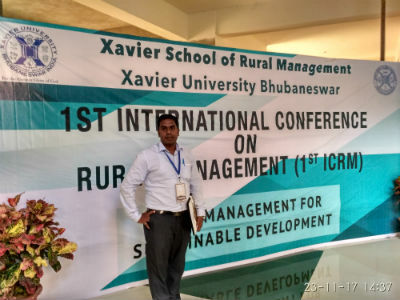 Bhubaneswar: Erudite faculty of Koustuv Business School Professor Pabitra Kumar Sahu has participated at Ist International Conference on Rural Management based on the theme “Rural Management for Sustainable Development”. This International Conference was held at Xavier University, Bhubaneswar on 23rd & 24th November 2017. This international conference focuses on exploring how the field Rural Management and its thematic areas intersect with and underpin the efforts towards sustainable development. On this auspicious occasion addressing the technical session on Agribusiness Management, Prof. Sahu had presented his paper on “Entrepreneurship Opportunity for Indian Rural Youth”. In his address, Prof. Sahu stresses how the Indian rural entrepreneurs are generating livelihood opportunity and decent work, for sustainable development.